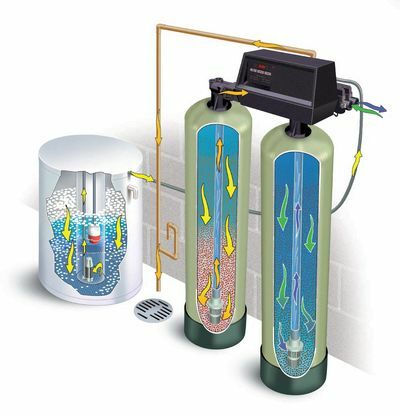 One of the most underrated “green” products available is the twin tank water softener. Although the initial cost is more, twin softeners can pay for themselves in water and salt savings. They also offer the satisfaction of being the most environmentally friendly of conventional water softeners. A twin softener is essentially two identically-sized water softener resin tanks joined and controlled by a single softener valve. The control valve can be either a timer or a metered regeneration style, with metered being strongly preferred for this type softener. To dispel a common misconception about twin softening units, the two tanks work one at a time. That is, you don’t get double softening. A single softener tank is more than adequate to reduce the hardness of most residential water to virtual zero. The twin unit operates by keeping one of its tanks in reserve. When the capacity of tank one is reached, the control valve immediately puts tank two into service, so that there can never be a time when hard water is being sent to the home, as can happen with single tank softeners. Even when a tank is being regenerated, soft water is being delivered to the home. And, unlike the single tank unit, twin units use soft water for regeneration. Since the switch from one tank to the other can be made at any time of the day or night, no “reserve” needs to be programmed into the softener. With conventional one-tank units, a certain amount of the tank’s capacity–usually about one day’s expected usage–is always held in reserve. This is accomplished by simply programming the softener to regenerate a day early. By conservative estimate, this “reserve” requirement is responsible for about 15% of the salt and water used by a single-tank softener. Simple arithmetic tells you that if a softener that regenerates once a week always regenerates one day early, in a year it will simply throw away 48 days worth of its softening capacity. And what is really being tossed away is water and salt. Twin tank units are especially good for applications that require a long, uninterrupted supply of soft water. For example, if a softener is used to pretreat hard water for a large reverse osmosis unit, it is difficult to assure that the reverse osmosis unit will not demand water when the softener is regenerating. A twin tank unit solves this problem by providing a never ending supply of soft water. Twin softeners are the most water and salt efficient softeners made. They regenerate less frequently because no “reserve” capacity has to be calculated. They have the added advantage of performing the regeneration with softened water, assuring a cleaner and more complete regeneration. Twin softeners are especially useful for applications requiring long service cycles that need an uninterrupted supply of soft water.